Voter ID and ME… with update. UPDATE: The following was written a year and a half ago. Since then I’ve tried three more times to correct the disparity between my driver’s license and my voter’s registration. As it stands now, my driver’s license spells my last name all one word but my registration separates the ‘De’ from the rest. The poll workers know me but tell me if Pennsylvania’s voter ID law goes into effect, I will not be permitted to vote. Yeah. 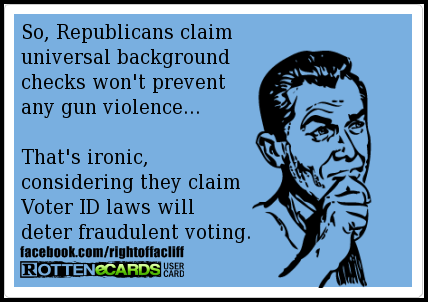 Don’t tell me voter ID is about fairness. I’m a registered voter in Pennsylvania, one of the numerous states whose Republican Governors have proposed laws to require voters to present “State Approved Identification” in order to cast a vote in upcoming elections. On the surface, these sound like common sense laws. In reality, they are bureaucratic nightmares. These laws are solutions to problems that do not exist. But that’s not what this post is about. During last November’s general election, the courts had put a stay on Pennsylvania’s new Voter ID law. They found that there wasn’t enough time to provide proper ID to the thousands of Pennsylvanians who didn’t have it. The lines at the PA DMV were so long that people were being turned away. It was decided that voters would be asked for ID, but it would not be required to vote. Poll workers were also instructed to ensure that each voter’s ID correctly matched what was on record, and to advise the voter to rectify it before the next election. There were leaflets and everything. I didn’t think this would be an issue for me. I had my ID. So, with ego properly inflated, I confidently marched up to polling place and proudly presented my driver’s license. Apparently, my middle name is spelled out on my driver’s license, but my voter’s registration shows only an initial. My registration also shows a “Sr” after my name, as in Frank Senior. This is ostensibly a problem because I don’t have a son named Frank Jr.. NOTE: Other than my address, the information on my voter’s registration has not changed in almost three decades. After voting, I thanked the nice woman and promised I would fill out a new registration form with the correct information. All was well with the world. Being the procrastinator that I am, I filled out the new registration form at the end of March. There were a myriad of reasons why I waited. There always are. Three weeks later my new voter’s registration arrived by mail. The new registration is printed exactly the same as my old one, with the exact same errors. What gives? How difficult is it to copy information from a piece of paper? How hard is it to check the information found on my driver’s license, and enter it into a database? Wasn’t that the reason I was asked to provide them with my license number? I contacted the Election Commission and spoke to a very patient gentleman who was as puzzled as I was. He accessed my driver’s license information to verify my identity. He looked at a scanned image of my new application, which had the correct information. and couldn’t understand why the records hadn’t been updated. After a few questions, I was told that my new registration should arrive within a week. It took almost four weeks for the new voter registration to arrive, just in time for Pennsylvania’s Primary Election. This time, my last name was altered. I have an Italian last name with a “De” prefix, as in DeNiro, DeLuca, or DeAngelo. Pennsylvania driver’s licenses use all capital letters, and the De is not separated from the rest of the surname. On the new voter’s registration however, the prefix IS separated. You wouldn’t think this was an issue. Apparently, the poll workers thought it was enough of an issue that it needed to be addressed. I was told that I could be turned away because of that simple technicality. REALLY?? Now I have to contact the Election Commission AGAIN, and walk them through the correct spelling of my name. Does anyone else see the problem, here? I also don’t want some inattentive paper pusher’s mistake to prevent me from casting my vote. How can they ask for proper ID if they’re not going to ensure that the information they record is correct? Why must I jump through hoops if a bureaucrat can’t get it right? If we can’t ensure that everyone can easily obtain the proper ID required to cast a vote, then we need to stand down on aggressive laws designed to make it virtually impossible to engage in our Federal Voting Right. I threw that last thought in there as an expression of my angst. PS: The point of this rant is simple. I’m surviving on minimal resources. If I’m having trouble meeting the requirements for “State Approved Identification”, what about the people who don’t even have what I have?